Sir Ronald Sanders has a unique breadth of senior experience of the Commonwealth. He has a strong vision of it being more relevant and effective for its member states and an influence for progress in the global community. - Served for two periods on the Board of Governors of the Commonwealth Secretariat in 1984-1987 and 1996-2004, and on the Board of Governors of the Commonwealth Foundation. - Participated in meetings of Commonwealth Heads of Government and Commonwealth Foreign Ministers since 1983 and led delegations to Meetings of Senior Officials and in various negotiating and drafting groups. - Worked as an active member of the Commonwealth Committee on Southern Africa to end racism and apartheid, and was one of three High Commissioners elected by his peers to liaise with the UN Committee against Apartheid. - Served as a special adviser to the Commonwealth Secretariat and the World Bank on small states. - Worked as a member and the Rapporteur of the Commonwealth Eminent Persons Group (EPG) commissioned by Heads of Government to report on reform of the Commonwealth (2010-2011). He drafted the report of the Group which formed the basis for the restructuring of the Commonwealth and its current strategic plan. Sir Ron has a solid background as a scholar, writer and advocate for the Commonwealth. He is currently a Senior Fellow at the Institute of Commonwealth Studies, University of London and also a Senior Fellow at Massey College, University of Toronto. He is acknowledged as one of the leading Commonwealth authorities on small states, a subject on which he has written and spoken extensively. His published works on the Commonwealth in books, journals and newspapers are widely cited throughout the Commonwealth. This was recognised by the award of an honorary Doctor of Letters (D.Litt) by the University of the West Indies in October 2014. Sir Ron is also a member of the International Advisory Board of The Round Table: The Commonwealth Journal of International Affairs . He is eminently knowledgeable about Commonwealth affairs and well equipped to meet the intellectual challenges of the post of Secretary-General. Sir Ron also has a business background, having been variously a General Manager, a chief negotiator and a company director of telecommunications organisations in Guyana, Barbados, Belize and the United States; financial institutions in Antigua and Barbuda and Geneva; a sustainable forestry company in Guyana; and as consultant on public-private sector partnerships to a leading legal firm in Canada. His experience of leading multi-disciplinary teams across borders will be invaluable. of connections with large private sector companies to bring additional resources to the development work of the Commonwealth. - Senior Ambassador with cabinet rank. - Chief Negotiator on aid and investment agreements with the People's Republic of China; a Bilateral Investment Treaty with the United Kingdom; Tax Information Exchange Agreements with the US, Australia and New Zealand; a Bilateral Air Services Agreement with the United Kingdom. - An elected member of the governing Board of UNESCO (1985-1987). - An elected member of the International Programme for the Development of Communications at UNESCO (1983-1985). - Ambassador and negotiator at the World Trade Organisation (1997-2004) for small and vulnerable economies. He is the only ambassador of a small state to lead successfully a trade dispute at the WTO against any country (in this case, the USA). 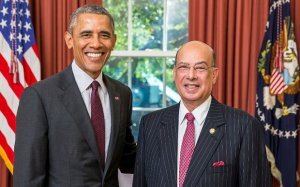 - Chairman of the Caribbean Financial Action Task Force against drug trafficking, money laundering and financing of terrorism (2002-2004); he has also worked with the G-7 created Financial Action Task Force and the IMF in furtherance of international best practice in regulation and enforcement. - Deputy Permanent Representative to the United Nations and non-resident Ambassador to the Commission of the European Union. His work with several international organisations provides the basis for networking Commonwealth concerns into the wider international community to achieve the attention they deserve. Sir Ronald's wide diplomatic and international experience makes him an ideal candidate to rise to the challenges of engaging member states at the highest level in a renewed and revitalised Commonwealth. The global community is faced with challenges, including: dealing with terrorism, intolerance, gender, youth unemployment, debt, poverty, extreme inequality within and between nations, the lack of development finance, climate change, the plight of small and vulnerable economies, and the urgent need for fair trade and greater trade facilitation. The Commonwealth alone cannot solve these problems but it can make a meaningful and vital contribution to overcoming them. To do so, the Commonwealth has to be revitalised and made more relevant. The Commonwealth represents over 2 billion people, a quarter of the United Nations' membership and consists of nations from every continent. It includes every major racial and religious group in the world and is uniquely placed to develop initiatives and pursue solutions to global problems. But it faces two major, interrelated problems. The first is a lack of financial resources. The second is a North-South divisiveness that weakens the association whose great strength was always its capacity to marry diversity into consensus – to be flexible in the pursuit of common and vital goals. Both issues have to be tackled. More resources have to be mobilised on the basis of beneficial performance that can be measured, and the emphasis must be placed on meeting development challenges within a framework of political stability that encourages investment and trade. The absence of vibrant initiatives to keep Heads of Government fully engaged in preserving and strengthening the Commonwealth has led to the inertia and lack of enthusiasm we now see. The machinery of the Commonwealth Heads of Government Meetings has lost its effectiveness and attraction. Fewer Heads of Government are attending Summit meetings and the “retreat” – the mechanism in which they alone talked freely and frankly with each other on a range of crucial issues – has been weakened. The absence of meaningful consultation between governments and non-governmental organisations has also weakened enthusiasm for the potential of the Commonwealth as a force for good. Healing rifts, rebuilding confidence and consensus, restructuring machinery and lifting the profile of the Commonwealth are the essential tasks at hand if the association is to continue to play a dynamic role in the development of its member states and to contribute to solving shared global problems. These tasks require experience of the operations of the Commonwealth Secretariat..
VALLETTA, Malta – 26th November 2015......Prime Minister the Hon. Gaston Browne has reaffirmed his government's support for Sir Ronald Sanders for the post of Commonwealth Secretary General amidst a smear campaign by individuals believed to have vested interest in advancing their personal agenda. “Despite the recent malicious and deliberate attacks on Sir Ronald in a UK based newspaper, Sir Ronald is still the candidate of choice for the post of Secretary General and Antigua and Barbuda is firmly behind our candidate. The attacks show the desperate lengths that persons are prepared to go to achieve their goals,” said Prime Minister Browne who is in Malta for the Commonwealth Heads of Government Meeting. He said that the fact that the article in the UK newspaper alleging wrong doing by Sir Ronald in a matter that never made it to court and which was rubbished by the country's Director of Public Prosecutions, is released on the eve of the most anticipated election for the organization, is proof that it was designed to affect Sir Ronald's chances of succeeding. “We maintain that the Lindquist report is nothing else but a partisan political witch-hunt and is riddled with hearsay, rumour and conjecture. Sir Ronald's track record within the Commonwealth sets him apart from the others and Antigua and Barbuda is pleased to present him for service to the Commonwealth as its next Secretary General,” Prime Minister Browne added. While the article in the UK based newspaper reported the allegations which were being promulgated by the Opposition United Progressive Party and its affiliates, it admitted that Sir Ronald remains the front runner for the post of Commonwealth Secretary General. The said article is understood to have been peddled around the British media circuit before being printed. “We will redouble our efforts to ensure that this smear campaign does not succeed and that Sir Ronald Sanders becomes the next Secretary General of the Commonwealth,” concluded Prime Minister Browne.